Whose territory does a new prospect belong to? Does this sound familiar to you? We talk to companies all the time who have problems with who to allocate a new customer or prospect to when they ring the sales or franchise company or call centre. Sales territories have always been a bit of a problem to deal with, but this will no longer be a problem for people who use GeoSmart’s new BIonaMAP business intelligence SaaS (Software as a Service) application. Old school BAU (Business As Usual) is still the way most sales and service companies work. They pin a map on the wall, draw the territory on it with a sharpie pen and write the name on the map. There are always arguments over whether a territory includes both sides of the road, where the suburb boundaries are and don’t even start about what happens when you want to modify a territory. If the call centre or people taking the calls don’t have access to the map when new customers ring, there can be major time wasting and potential for problems ensuring that the right person is dealing with the client quickly and professionally in order to secure new business. There are also issues over making sure the address is correct. 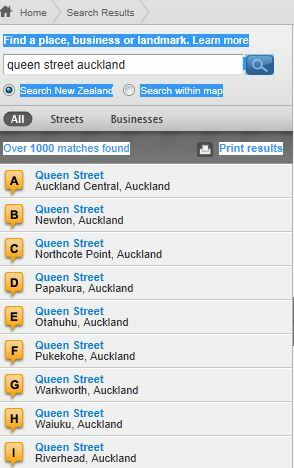 There are a dozen Queen Streets in Auckland and we have heard plenty of stories about people driving up and down a road in the wrong suburb looking for a client they are meant to be meeting with. Then there are vanity suburbs like the person on Remuera Road who say they are in Remuera, but they are actually in Newmarket and knowing which numbers of the street belong in which territory. It is a problem that has been around for years. This problem goes away with BIonaMAP and there are a number of ways that we can deal with it. Some companies are simply going to use a query on the BIonaMAP home page which effectively allows you to start entering the address, with an autocompleter allowing you to select from a drop down menu to get the right one. Some companies are going to integrate this function right into their accounting software, CRM or other business database application, which means that the full correct address with Post Code and correct suburb as well as the coordinates are recorded into the right fields. It belongs in Territory X. If this is an issue that you have to grapple with in your business, why not contact us and ask us how BIonaMAP can help you? BIonaMAP is available for New Zealand and Australia and has a host of location based business analytics capability. It is Software as a Service which means no software installation and it can be accessed by using a web browser. We also welcome inquiries from sales, service, franchise and other business consultants, resellers and systems integrators. GeoSmart is a New Zealand based Geospatial Solutions Provider. What does that mean? If you want anything to do with location, we are the people for you to get in touch with. We have driven all of New Zealand as well as flown most of it to gather orthophotography which is used by many GIS departments in regional and local government. We have the only full turn restriction database in New Zealand, which in simple terms means that we have eliminated the paper roads designed in Scotland in the 1800’s which still exist on paper and in many mapping products, we know all about the no left or right turns, one way streets, legal and implicit turn restrictions and much more including a huge database of Points of Interest including businesses, accommodation, petrol stations right down to public toilets, boat ramps, places of geographic or historic interest and more. Web Mapping API’s and Web Services for applications of all sorts with the most thorough information available including GeoCoding, Points of Interest, Driving Directions, Vector Graphics, Reverse GeoCoding and much more. We love to hear from and work with new ventures, people trying to solve spatial problems, develop new web sites, games, social networks or anything to do with location. As Sales & Marketing Manager, this is a semi informal place for me to share ideas, knowledge and generally share some of the things we are working on. Feel free to comment or make contact with me.